Here at ChiIL Mama we dig Chi, IL architecture. Without it, Chicago would still be a smelly onion swamp! Our architecture is a big part of what makes our city so great. Our buildings are amazingly cool to look at and learn about, and what's even cooler is getting a sneak peek, behind the scenes tour. Highly recommended! It’s that time of year again – the Chicago Architecture Foundation (CAF) is hosting their big Open House on 10/18 and 10/19, where they open the doors to 150+ neat old/historical sites in the city for the public to explore. There are a bunch of new family-friendly sites to visit this year! Click the links above for all the details then get to see Chicago's hidden places and spaces. See the 100-year-old fire pole at the historic Firehouse Chicago, be a super sleuth and spot counterfeit bills at the Federal Reserve Building’s Money Museum or check out the model train set at the Garfield-Clarendon Model Railroad Club with over 1,400 feet of railroad track and hundreds of model trains. This year also features a free family program at the CAF ArcelorMittal Design Studio, where families can enjoy facilitated hands-on activities using LEGO architecture bricks. Disclosure: It's our pleasure here at ChiIL Mama, to partner up with Chicago Architectuer Foundation again this year, to spread the word about Open House Chicago. Thanks to them for providing us with a 4D Puzzle for our readers and one to review. 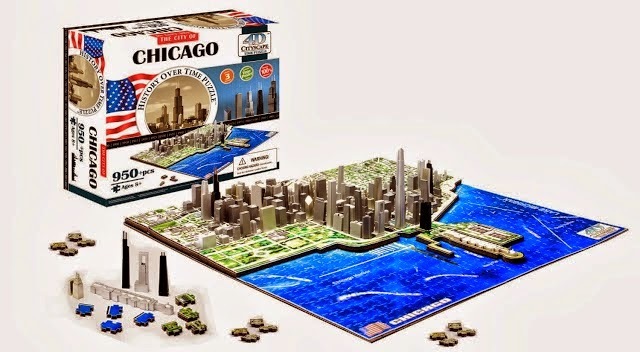 In the spirit of building, ChiIL Mama has an awesome 4D puzzle of the Chicago Cityscape ($44.95 value) to give away to one of our lucky readers. Open nationwide. Enter through midnight 10/31. The Chicago Architecture Foundation’s Open House Chicago is a free public festival that offers behind-the-scenes access to 150+ buildings across Chicago. Some rockin' musician friends do Open House Chicago with their family each year. And they pick a different neighborhood to explore each time. There are more than plenty to pick from. We also love hitting the theatre district. The Oriental, one of our ornate favorites, is having back stage tours, as is the Lyric Opera and the Joffrey Tower.